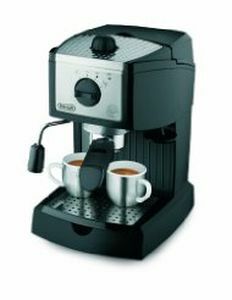 Coffee maker designed specifically for making espresso. It can be electric or nonelectric. The nonelectric maker is hourglass-shaped appliance used to make espresso. The base is filled with fresh water and the center basket with finely ground coffee. Heat forces steam and boiling water through a central vent and across the coffee grounds; the finished espresso is then collected in the top container. Also see Boil Over Preventer, Coffee Filter, Latta Glass.